After the Holy Sacrifice of the Mass and the Divine Office, the most effective prayer is the Most Holy Rosary. For 800 years it has been the cause of innumerable miracles, conversions, and victories. The rosary brings peace; not a false peace, illegitimately gotten through compromise, but a true peace, won honestly by directly opposing evil with good. The rosary, when prayed with humility and a simple confidence in the good God Who lavishes his wonders on his children, saves nations from annihilation. It is a sure vehicle of salvation, to save us from that ultimate annihilation, the only one that really matters in the end–hell. The enemies of Christ hate the rosary. These pawns of Lucifer have contempt for it. Their malice is a wonderful testimony to the irresistible power arrayed against them. Christians, though, love the rosary; not just for what it accomplishes–that it dispels the darkness of heresy, appeases the wrath of God, and drives away those that hate Christ. They love it simply because of who it leads them to. The 20th century saint, Padre Pio, said, “The rosary is the weapon.” Who is behind it? Who gives it its power? Indeed, “Who is she that cometh forth as the morning rising, fair as the moon, bright as the sun, terrible as an army set in array?” That person is Mary. It’s tremendous power comes from the exalted position of the Ever-Virgin Mother of God. 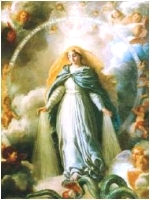 Pope Leo XIII explains, “The recourse we have to Mary in prayer follows upon the office she continuously fulfills by the side of the throne of God as Mediatrix of Divine grace; being by worthiness and by merit most acceptable to Him, and therefore, surpassing in power all the angels and saints in heaven” (Iucunda Semper Expectatione). “The power thus put into her hands is all but unlimited…. Among her many other titles, we find her hailed as ‘our Lady, our Mediatrix,’ ‘the Reparatrix of the whole world,’ ‘the dispenser of all heavenly gifts’” (Adiutricem). It was Our Lady herself who gave us the rosary eight centuries ago. She called it “her psalter,” indicating the 150 Hail Marys that followed the pattern of the 150 Psalms in the Church’s psalter. She gave it to St. Dominic for the express purpose of finally crushing the depraved Albigensians. “Guided, in fact, by divine inspiration and grace, he foresaw that this devotion, like a most powerful warlike weapon, would be the means of putting the enemy to flight, and of confounding their audacity and mad impiety” (Pope Leo XIII, Supremi Apostolatus Officio). The Most Holy Virgin in these last times in which we live has given a new efficacy to the recitation of the Holy Rosary. 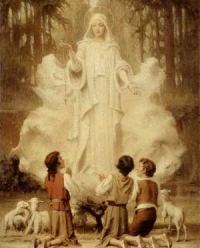 She has given this efficacy to such an extent that there is no problem, no matter how difficult it is, whether temporal or above all, spiritual, in the personal life of each one of us, of our families, of the families of the world, or of the religious communities, or even of the life of peoples and nations that cannot be solved by the Rosary. There is no problem I tell you, no matter how difficult it is, that we cannot resolve by the prayer of the Holy Rosary. When we pray the Holy Rosary, we enter, mind, body, and soul into a rich storehouse of spiritual treasure. It is made up of 150 Hail Marys, a number which significantly corresponds to the 150 Psalms; 15 mysteries of the life of Jesus and Mary, divided organically into 3 cycles; the Our Father, which introduces each mystery; and the Doxology, which concludes them. 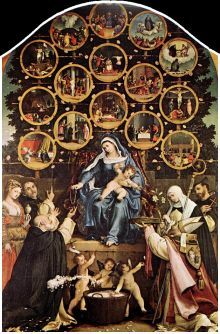 These different parts make up such a harmonious, inter-related, indivisible, and integral whole that Pope Pius XII called the Rosary, the “compendium of the entire gospel.” It is simple enough for the most unlearned yet inexhaustible in mystical and theological depth. It can be recited at any time by anybody. Moreover, it is one of the richest sources of plenary and partial indulgences. What a beautiful blog site and a very informative blog. Thanks for sharing. Feel free to stop by my blogs. I will be coming back to yours. God bless.